The European Space Agency's exoplanet-hunting satellite COROT has discovered a bizarre object that could be a brown dwarf (failed star) or it could be a planet, but it's not close enough to either to fit into any of the categories we use to classify stuff in our universe, according to an ESA press release. 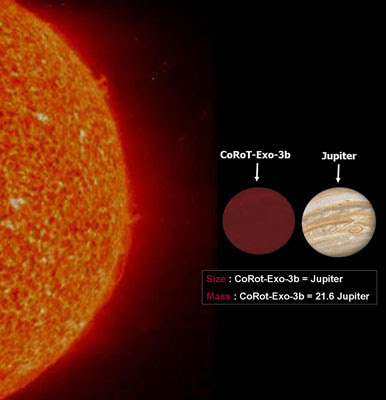 The object, called "COROT-exo-3b", is the size of Jupiter, but it's 20-times the mass. That makes it twice as dense as lead and the densest planet-like object yet. It's circling close to it's parent star and moving pretty fast, too. An orbit takes just four days and six hours. Pound360 thinks this is pretty amazing. It seems that, the deeper we look into space, the more diverse the universe becomes. Imagine how boring it would be if everything we found were Jupiter-like, asteroid-like or star-like. Finding stuff in between means there's a lot of incredible discoveries to make.